← Home vs. office: Where should you work? 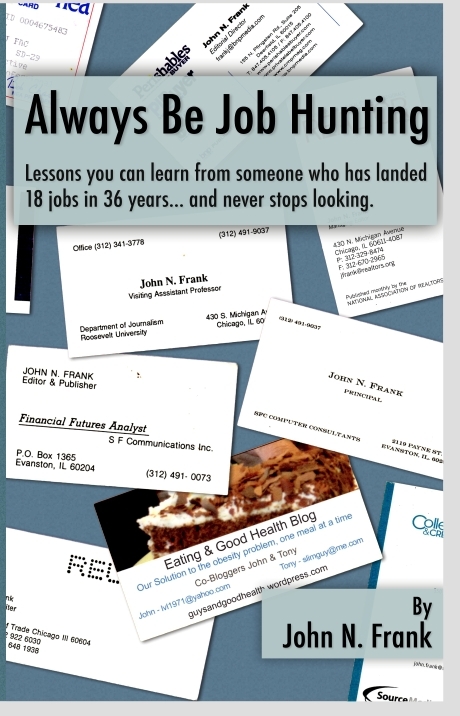 When a coworker asked to buy a copy of my book, Always Be Job Hunting, recently, I wondered what her reaction would be to reading about my career and the choices I have made. Last week, she gave me my answer in the form of this book review. I was truly touched by her insights and sentiments about the book, I hope it will help others as well. Always Be Job Hunting. The title says it all. When I first heard my new coworker at the time had written a book, I was quite surprised. When I heard it was a book about his career search, I was intrigued and interested. However, I was not quite ready to take the plunge and read it. Now more than a year later, after some soul searching of my own, I have read and can truly appreciate it for what it is: a coming of age story. Throughout John’s account from the very beginnings of his career to the last chapter when he starts at Mintel, I feel I am with him every step of the way through happier times, fast times, fun times, and even sad times in his career. 1) Always be on the lookout for the next best thing. John reminds us to never become too comfortable and stagnant, and to continue to be on the lookout for the next best thing. The glass ceiling is real! 2) Anything is possible. When one door closes, an even better door (or job opportunity) is right behind a new door with your name on it. 3) Maintain a positive attitude and outlook. Although there are a few instances where his mercurial nature emerges, John’s natural calm demeanor always prevails allowing him to make level headed decisions in his career. 4) Make the most of every situation. Each and every position, role, and responsibility is an opportunity to learn more about yourself, and how you handle them is what matters most. 5) Never settle. This is perhaps the most important realization in the book. As the saying goes, you are what you put up with and what you accept. Accept only the best. However, throughout his job hopping, John’s realization of what is most important is evident: you work with that which is most important to you. John’s desire to achieve a work and family balance makes him a pioneer in working from home and provides a very stark reminder to never sacrifice what you love most for a job. What I learned most from this book is that jobs may come and go, however it is very important that you maintain your integrity and keep that which is closest to you in your heart, and never sacrifice your family and personal life for a job or career. As someone fairly early in their career, I appreciate the practical tips, tricks, and advice on navigating the job search, as well as the heartfelt wisdom on balancing career needs and family needs. This book is a must read for anyone — college students, recent college graduates, and anyone who is contemplating a serious career change. For the more experienced worker, this book is a refresher and inspiring story to keep the faith, believe, and walk in the direction that best fits you. Hey, If John can do it, so I can too! Thanks John for such an inspirational tale into your work life. It was just I need to move forward with everything. This entry was posted in finding a first job, job hunting and tagged Always Be Job Hunting, First job, job hunting, job opening. Bookmark the permalink.